The name Jewel Cut Glass Company was adopted in 1907 by a company (the C. H. Taylor Glass Company) that was founded the previous year. Revi (1965, pp. 226-228) has presented the bare bones of this enterprise whose history is currently being investigated. Although the company’s patented patterns were designed late in the brilliant period, the Aberdeen and Emerald patterns, in particular, are highly regarded by today’s collectors. Apparently the company never used a trademark. In 1912, on 19 March to be exact, four patents for cut-glass patterns, designed by Henry R. Luckock and Charles H. Taylor, were granted by the U. S. Patent Office. 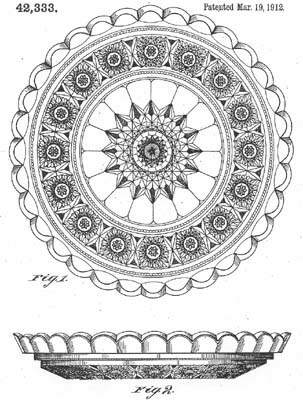 The patentees assigned their patents to the Jewel Cut Glass Company of Newark, NJ. 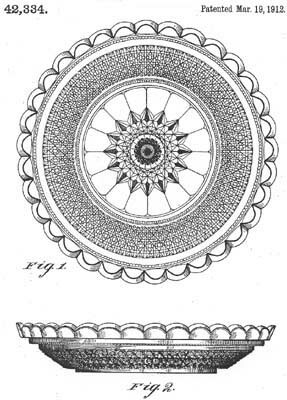 Two of the patents, nos. 42,333 and 42,334, have long been considered to represent designs of high quality, expertly realized. The story of their names is interesting — not least because it can be told in some detail — and is typical of the changing pattern names that dealers and collectors frequently encounter. The veteran cut-glass enthusiast is not surprised when he finds that a particular pattern has more than one name, although only one is official. Lacking catalogs, early investigators all-too-often were forced to be creative and assign a name that could be used to identify a particular pattern temporarily, until its true — that is, official catalog — name could is discovered. Today, when the true name is often known, this assigned name often hangs around like a guest who has overstayed his welcome. Worse, the name is frequently presented without the quotation marks that indicate its temporary status. The examples in this file have each had three different names, two assigned names and one official name. Neither of these patterns is mentioned in Dorothy Daniel’s book, published in 1950. Regrettably, Daniel’s interest waned somewhat by the time these patterns were cut, probably because she had self-imposed a cut-off date of 1905 for the brilliant period. The patterns cut by the Jewel company first appeared in books that were published in 1965: by C. A. Revi and by J. Michael and Dorothy T. Pearson, respectively. Revi does not acknowledge the Pearsons in his book and the Pearsons do not mention Revi in theirs. Was this a horse race between these successors to Daniel’s pioneering work? The following is a close-up of the fine-line cutting on no. 42,334. Althoughg this indicates that the cane motif is called for, an actual example of this pattern, shown in Pearson’s ENCYCLOPEDIA (Vol. 3, p. 71), substitues hobnail (hence Pearson’s assigned name for this pattern in 1965). The authors acknowledge their use of “generic” (that is, assigned) names in their earlier book, but since then they have been able to examine one of the J. Hoare & Company scrapbooks that are at the Rakow Research Library, Corning. In these books Hoare collected illustrations of his competitors’ cut glass, and included his own as well. The Pearsons report that this is where they found the true names for these patterns. Although the Pearsons;’ second book indicates that the true names for the patterns are Aberdeen and Emerald, one always appreciates additional information. In the February 1999 issue of The Hobstar, a correction sheet for Revi’s book provides this confirmation. Equally important, an “identification source” is also provided — the trade journal Crockery and Glass Journal, issue of 21 Dec 1911. In this issue one finds a full-page ad from the Jewel Cut Glass Company that not only illustrates and names the four patented patterns — which are considered to be “strong features of the ‘Jewel’ line for 1912” — but also indicates that “Every article in these patterns will be cut entirely by hand from plain blanks. . . .” The company was clearly aware of the deleterious effect that wide-spread use of the “figured” blank was having on the American cut-glass industry at this time. The pattern names of Aberdeen and Emerald can thus be accepted, as can the names of the other two patented patterns — Diamond and Ruby — both of which are realistic (floral) patterns. Nevertheless, a catalog from the Jewel Cut Glass Company that contains these patterns would be welcome. In this regard a rumor persists that such a catalog is available, but details are vague and inconclusive. If such a catalog exists it may have been reproduced off-market and, therefore, not be generally available. Even without a catalog, however, the pattern names of Aberdeen and Emerald are now firmly established, bringing this tale of pattern-naming to a satisfactory conclusion.